For a live, deployed production, InterSystems recommends that you use the auto-start option. The other options are intended primarily for use during development. Select Interoperability > List > Productions. InterSystems IRIS then displays the Production List page. Select the production that you want to start. InterSystems IRIS displays the production. Select OK. InterSystems IRIS displays a dialog box that indicates progress. When the dialog box shows it is Done, select OK. Select the production that you want to stop. This must be a production that is running. You can specify that a production is automatically started in a namespace at system startup, and is automatically stopped at system shutdown. This option is the recommended way to start and stop productions. To access this page in the Management Portal, select Interoperability, click Manage, and then click Auto-Start Production. Select the production from the drop-down list. InterSystems IRIS displays a dialog asking you to confirm that you want to auto-start this production. Do not select any productions from the drop-down list. InterSystems IRIS displays a dialog box asking you to confirm that you do not want to auto-start any production in this namespace. A different page lets you override auto-start for all productions. If you define a production to auto-start in a mirror configuration, it automatically starts on the current primary node in a failover situation. No further action is necessary. For details on the mirror failover process, see “Mirroring” in the High Availability Guide. In the Management Portal, select System Administration >Configuration > Additional Settings > Startup . This displays the Startup Settings page. Select Edit next to the EnsembleAutoStart setting. When you next restart InterSystems IRIS, InterSystems IRIS does not automatically start any productions in any namespace (except for any productions that you automatically start in some way other than the auto-start settings documented in this chapter). The Management Portal automates the process of deploying a production from a development system to a live system. Overview of Deploying a Production describes this process from the developer’s point of view. This section describes what InterSystems IRIS does when you are loading a new version of a production on a live system. The developer has provided you with an XML deployment package file that contains an updated version of your production. This deployment package should be deployed to a test system before deploying it to the live system. To load it on the live system, select the correct namespace and select Interoperability, Manage, Deployment Changes, Deploy, and then click the Open Deployment or Open Local Deployment button, depending on whether the XML deployment package is located on the server or on the local machine. The Open Local Deployment button is not active if you are on the server machine. After you select the XML deployment package file, the form lists the new and changed items in the deployment package and displays the deployment notes that were specified when the package was created. Rollback filespecifies the file to contain the rollback information. When you have read the deployment notes and made any changes to the deployment settings, complete the deployment by clicking the Deploy button. InterSystems IRIS does the following to stop the production, load the new code, and then restart the production. If you are using studio, you use the Tools Import Local or Import Remote to import the XML file. But you must then manually compile the components and then disable and re-enable them in the production. Using the Import classes button on the Management Portal System Explorer does automatically compile the classes, but it does not create a rollback package and disable the components. You can view the deployment history of the productions in a namespace. 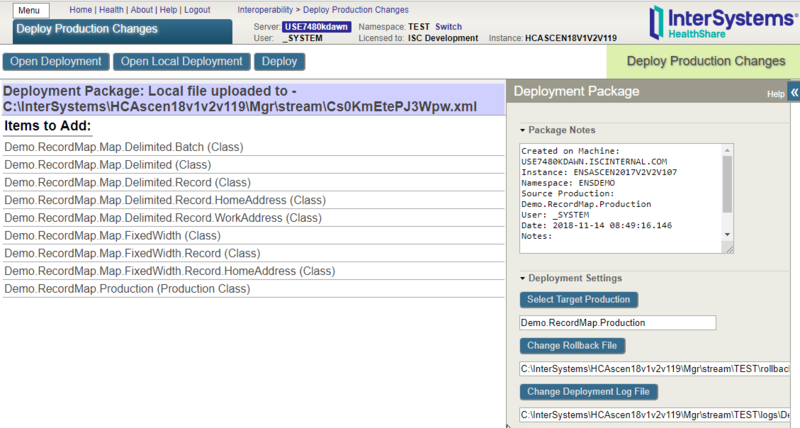 To view the deployment history, select Interoperability, Manage, Deployment Changes, and History. After you select one of the listed deployments, you can click Details to display information about the deployment, Rollback to undo the deployment changes, or Delete to delete the deployment history. Deleting the deployment history does not delete the rollback or log files.